Want to use your family photo as a cover for the business notebook? 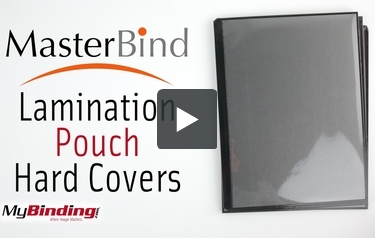 MasterBind has got you covered with the Black 11 x 9" Pouch Portrait Covers with tabs that will convert any image or design and laminate it to a front cover. The MasterBind Cover allows for an easy and quick book creation within minutes. Print your desire front cover, insert into the pouch cover, seal it with a laminator and it's ready to be bind. With the addition of tabs, organization became that much easier. Efficiently store and write in the book with knowledge of where it's placed provides a stress-free relief. This alternative option ensures a more personal touch to your covers, perfect for any office or home. Turn your favorite photo image into your new favorite book cover with the MasterBind Pouch Cover. Present the elegant, and personal booklet in your next meeting!